We are thrilled to have discovered this range of stunning silk scarves, designed in Britain and printed and hand-rolled in Italy. Each study features a single, detailed insect and begins as a unique piece of delicately wrought needlepoint which is then photographed, edited and transformed into the finished repeat pattern. The designs are then sent to Como in Italy where they are transposed onto the finest silk twill. Each one really is a work of art, opulent and timeless. The Glitter Weevil - is a dazzling creature with head and thorax of aquamarine markings over magenta with highlights of scarlet and gold is featured in concentric squares! 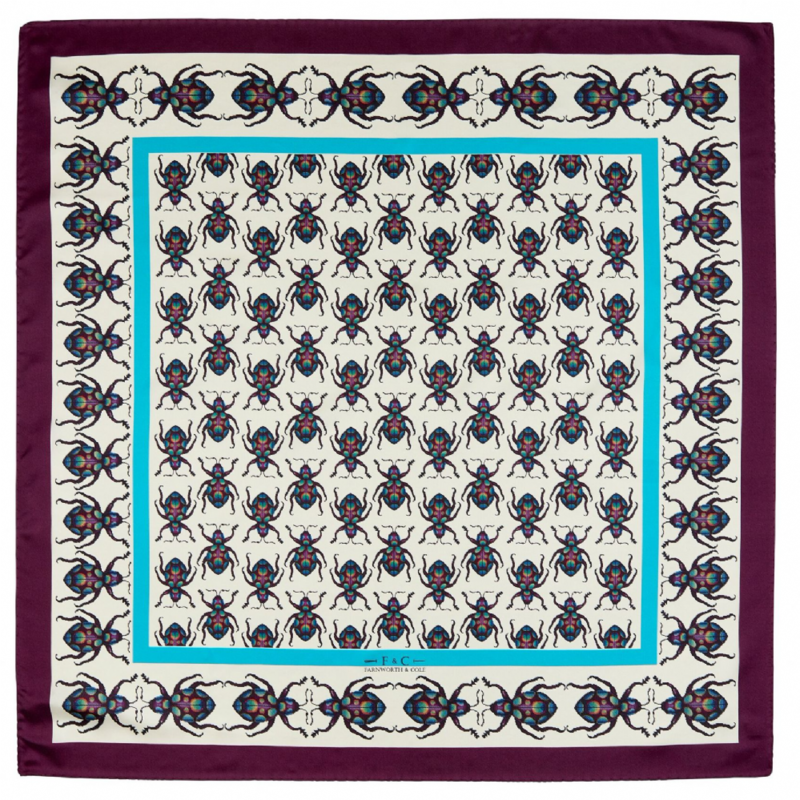 The scarf has an outer block border of magenta and and inner border of aquamarine over ivory silk twill.The Weevil is a symbol of power! Each scarf is boxed and wrapped in tissue paper . Scarves are 80cm x 80 cm square and should be tied loosely at the neck or worn as a headscarf a la Audrey Hepburn!